"The World Can Wait". Yet again Nestle Ice Cream brings another member to the family with the ever so luxurious indulgent LA CREMERIA Ice Cream Stick. Previously found in only tub format, ice cream lovers can now enjoy LA CREMERIA at their convenience, anytime, anywhere. The unravel of the product was in Golden Screen Cinemas, followed by a private movie screening of Jurassic World. LA CREMERIA is available in 3 flavours: Absolutely Almond, Heavenly Chocolate and Delightfully Pecan. I got a chance to try out their Heavenly Chocolate and gosh were they generous in the amount of inclusions. My entire La Cremeria Chocolate Stick was coated with almonds and every bite was crunchy sweet. Creamy vanilla ice cream with crunchy chopped almonds coated with rich milk chocolate and freshly sliced almonds – perfect for those who are absolutely head over heels with almonds. Rich chocolate ice cream with crunchy chopped almonds coated with creamy milk chocolate and crunchy cone crumbs – tastes so heavenly, it’s bound to leave you wanting more. Delicious pecan-flavoured ice cream coated with rich milk chocolate and freshly sliced almonds – a truly delectable delight! 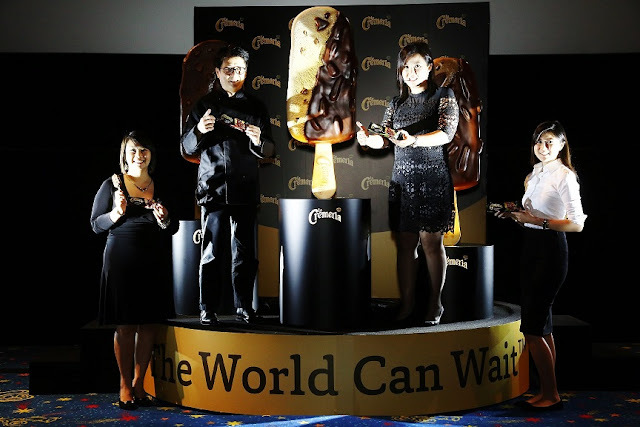 Along with the introduction of the new product, the brand also revealed its latest campaign, “The World Can Wait”, which highlights the importance of making time to enjoy the little moments that life has to offer. Which I couldn't agree more given with our busy schedules in life, it's important that we actually take time to notice and appreciate the little moments of life. “The World Can Wait” campaign also featured YouTuber Elizabeth Tan. I must have heard it about 5 times since she uploaded it. I guess you can totally tell that I am a fan. Heh. Been following her since her first viral video of HAVOC. Anyways for this campaign, the song she sang could totally hear her amazing deep soulful voice from this song. CLICK HERE to listen. Also this campaign will be supported with on-ground roadshows at selected Golden Screen Cinemas as well as BHP and Petronas stations nationwide from June onwards. LA CREMERIA® sticks are priced at RM3.50 and are available in major convenience stores and petromarts nationwide. Thank you Nestle for this treat!